Jeremy Scheinberg, CEO was previously the COO of Alcorn McBride, the leading manufacturer of audio, video and control products for themed entertainment. For over 10 years, he traveled around the world working on rides and shows for NBC, Universal, Lego and Disney. He has an MBA from the Carlson School of Management and BSEng in Systems Engineering from the University of Pennsylvania. Chris Harden, CTO, CCO, was previously Development Director of the EA Sports IGNITE UI team (Madden, NBA, UFC, NHL). He was the UI Engineering Manager at BSQUARE for Ford MyTouch UI and Coke Freestyle UI, and he helped to launch the Kindle Fire. He has an MBA from the University of South Florida, a BS in Electrical Engineering from Auburn University and two years Industrial Design from Auburn University. 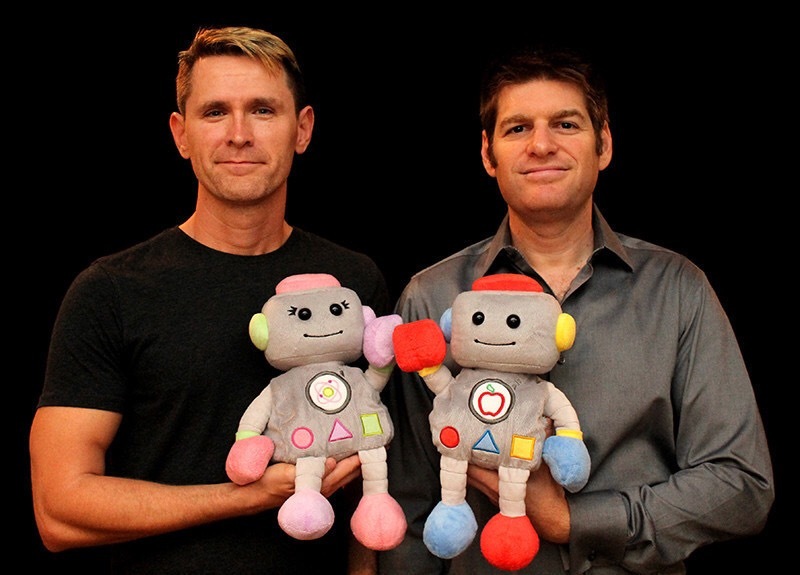 1) What is Trobo?TROBO the Storytelling Robot is a connected plush toy platform that helps to inspire kids 2-5 to learn about the amazing science, technology, engineering and math (STEM) in the world around them through personalized, interactive stories that run on an iPad or iPhone. 2)How did you come up with the idea for Trobo? We came up with the idea at a Startup Weekend event in Orlando. We had worked together several years before and happened to run into each other at the event. We both had kids at home and noticed that our kids were curious about STEM but there were no good toys for their age. Instead, they were playing with mindless toys and apps. As parents (and engineers) we wanted to give kids (and parents) better options. 2) Is it an alternative to a book or iPad? We see TROBOs as an alternative to mindless toys and apps. Books are great and we could never replace them. However, there are a lot of toys and apps out there that are simply idle playthings. We are trying to give parents a better option to inspire their kids to learn more about the world around them. 3) How did your experience on Shark Tank help your business? It definitely helped to make people more aware of TROBO. We saw a lot of traffic on our website and some good sales. The final edit didn’t really draw attention to our core mission of early childhood science/engineering education but we are continuing to work to get that message out. 5)What inspired you to go into business? Our families definitely inspired both of us. We see how our own kids learn and how they play and we want to give them every opportunity to grow. We feel that products like TROBO help not only our own kids but kids all over the world. Our children are the next generation of creators and we want to help inspire them. 6) What advice would you give to aspiring entrepreneurs? We would advise aspiring entrepreneurs to pursue your passion. It sounds simple enough but look for opportunities in areas that interest you. Then, vet those ideas and make sure they make financial sense – can you access the market and is that accessible market big enough for you to make a sustainable business. Run your numbers early and try to sell as quickly as possible; that helps you validate your idea and know whether it is going to work or not. We would like to thank Jeremy and Chris for speaking with us.